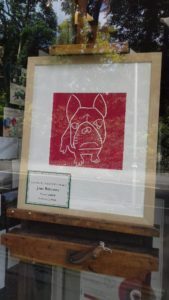 My French Bulldog is in the window of historic Green and Stone art shop on the Kings Road, Chelsea, London for a couple of weeks during August 2017. I like to think he’s watching the world go by. How much is that doggie in the window?! Congratulations to Green and Stone for celebrating it’s 50th birthday this year.